With a 31-mile electric-only range, the Cadillac CT6 Plug-in Hybrid offers nearly double what the rival BMW does. An 18.4kWh battery pack takes a minimum of 4.5 hours to charge, and powers two transmission-mounted electric motors that pair with a 2.0-liter turbo combustion engine for combined outputs of 335 horsepower and 432 lb-ft of torque. Notable standard equipment includes a 10-speaker Bose audio system, and heated and ventilated driver’s seat. Available safety features include night vision, and forward and reverse automatic braking. 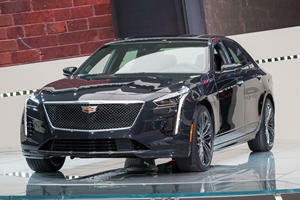 The Cadillac CT6 - Cadillac Touring 6 – is Caddy's entrant to the full-size luxury car segment. But In this segment it’s not just enough to be good, you must be exceptional, and technology filled to the brim! That’s why the focus of this review is on the CT6 Plug-in Hybrid – the rival to the S560e Pkug-in Hybrid and BMW 740e iPerformance. Like the BMW, it pairs a 4 cylinder turbocharged motor – the same as you’ll find in the ATS – to an electric system to derive its urge and add economy to the luxury on board. Like all competitors in this segment, large door openings afford easy ingress and egress to and from the CT6’s interior. Once inside, it’s a h and comfortable affair – with high quality materials like soft leather. There are however chrome elements that feel somewhat tacky – though thankfully these are few and far between. The design is logical, but lacks the coziness of the BMW and the opulence of the Mercedes-Benz. Head and leg room are more than sufficient for all occupants, especially those in the rear where even larger passengers will find the space commodious. There’s plenty space to stretch out in – though there aren’t foot rests in here like some rivals offer. But the CT6 PHEV faces the same compromises other plug-in hybrids do – the battery is mounted under the floor of the trunk and greatly impedes cargo volume. A standard CT6 boasts 15.3 cubic feet, but the Plug-in Hybrid loses a significant amount, offering only 10.6 cubes. This segment isn’t exactly known for engaging vehicles to drive. There’s the Jaguar XJ, but other than that few enjoy being tossed about. The rear-wheel drive of the CT6 Hybrid immediately gives it a sporting edge, but the firm suspension is what really gives it the edge. The steering is communicative and direct, and the CT6 changes direction eagerly. The suspension is firm and gives the CT6 purpose, devoid of the floaty, bouncing feeling of other luxury sedans of this size. But that edge also means that it doesn’t do the whole luxury thing as well as An S Class or 7 Series do. The primary ride is well composed, but the secondary jitters shake their way through to the cabin in a manner that’s frankly unacceptable in this segment. The brakes on the other hand, are firm and responsive and incredibly potent for a barge like this. Unlike standard combustion CT6 models, the Plug-in Hybrid is solely rear wheel driven. Power is derived from a 2.0-liter 4 cylinder turbocharged motor in tandem with two electric motors bolted to the transmission. The total system output is 335 horsepower and 432 lb-ft of torque, managed by a continuously variable transmission. The 18.4kWh lithium-ion battery pack is double that of the 7 Series hybrid, affording a 31-mile electric range. A full charge takes as little as 4.5 hours on a 240 volt system. 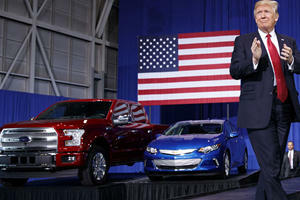 The EPA rates the CT6 Plug-in as having a combined 26 MPG equivalent. 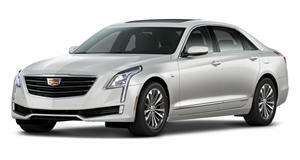 The CT6 Plug-in Hybrid takes many options on lower CT6 models and makes them standard. For your money you’ll get Bluetooth connectivity, a 10-speakewr Bose audio system, dual-zone climate, heated and ventilated seats, a panoramic sunroof, and a rear view camera, as well as a heads up display. The Driver Assist package also features as standard, equipping the CT6 PHEV with Adaptive Cruise Control, Night Vision, and forward and reverse automatic braking. 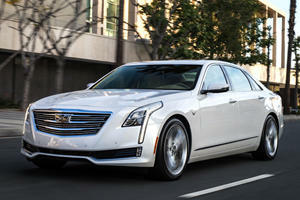 The Cadillac CT6 Plug-in Hybrid hasn’t been tested by either the IIHS or NHTSA. Whilst the reduced trunk volume may cause concern with some, the brilliant electric range is a huge . The handling dynamics too are a big positive. But in this segment, buyers might want something a little more comfortable, which the CT6 doesn’t offer. Are European And Asian Cars Safe From US Tariffs? How far will this trade war go?